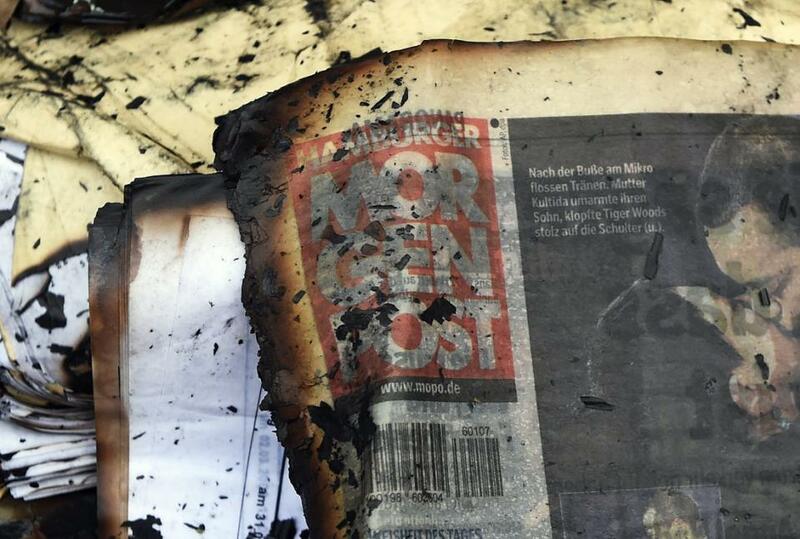 Vandals firebombed German tabloid Hamburger Morgenpost on Sunday. Two rooms on the lower floors were damaged in the attack. A German tabloid that reprinted cartoons from the French satirical paper Charlie Hebdo lampooning the Prophet Mohammed was targeted in firebombing Sunday, police said. With security services on high alert after a killing spree in Paris by Islamic extremists, police in the northern German port city of Hamburg said no one was injured in the blaze at the headquarters of the regional daily Hamburger Morgenpost, which caused only slight damage. “Rocks and then a burning object were thrown through the window,” a police spokesman told AFP. Police said the attack had occurred at about 0120 GMT and that two young men seen acting suspiciously near the scene were detained. State security has opened an investigation, a spokesman added. Whether there was a connection between the Charlie Hebdo cartoons and the attack was the “key question”, the spokesman said, adding that it was “too soon” to know for certain. Police declined to provide further information about the suspects. Two suspects were arrested according to the the Hamburger Morgenpost twitter page.